Job creation, financial stability, safety, and building a thriving community is what most of us, if not all, hope for in our city. What boosts our confidence is having someone in office who cares and has a track record of making positive changes in the community. County Executive Russ Pry is a man of vision who has not only made things happen, but continues to churn out good ideas and put plans into motion. "When you get articles like this," Pry said, holding up a November copy of the Fiscal Times, "You look at the 10 different places and see Akron, Ohio rated as number 8 in the United States in the middle/coming out of the worst recession in our lifetime. You see that for tough times we've been able to do some pretty good things" he said proudly. Pry has worked to keep the economy rolling in Summit County by doing things such as helping to keep Goodyear and Bridgestone facilities in the area, for instance. 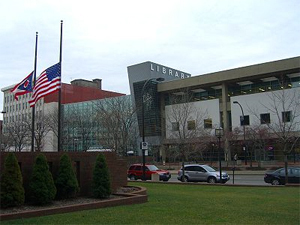 Our very own Akron Public Library is also one in a handful of library systems that has a 5 star rating…. Just one of many things Pry is proud of. Though the county has grown by leaps and bounds, Pry's work is never finished. Daily, he continues creating new plans and working on bettering the county. "My vision for this county is to make it the most desirable place to work, live and play," Pry said of his vision for Summit County. Not only does he want to keep it economically stable, but have state-of-the-art facilities, arts and creative ideas continuing to flow so that the county can continue to grow. "I want people to say 'I want to go to that county. Good things are going on there. There's a lot, they have good schools, parks, libraries, amenities and some really cool things going on," Pry said. Pry recently did a ribbon cutting at Summa Health System for their new state-of-the-art emergency room, which he says will be "one-of-a-kind" in the nation. There are also many great, new ideas being birthed here. "We're working with an idea right now with the Knight Foundation. 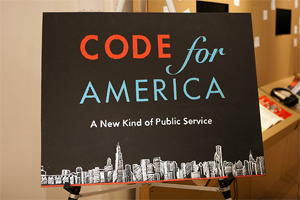 They want to bring a group into the county called the 'Code for America' which dispatches a lot of "techy" people. They want to bring them in and develop a system, a website, that would take you to all of the different parks," Pry explained. Though the positives have been abundant, Pry does have a lot on his plate, bringing plenty of challenges. The budget is currently the number one challenge. "The budget is clearly the ongoing challenge of all units of government. When you consider that we continue to see cuts coming out of Washington, we know that more are going to come. You listen to the debates between the Democrats and Republicans and the one thing that we know is that we will get less, regardless of how those debates come out," Pry explained. The state of Ohio cut local government funding by 50% last year. "So we will see less come back from the state in terms of money than has been coming in since the 1930's," he said of the losses. There is an upside though. "Most people don't realize that Summit County is one of the 3 lowest counties [in Ohio] for what we charge for sales tax to operate the county. All the other 85 counties actually charge the people that live there and shop there more than what we do to operate their local government," Pry said. The other challenge he faces is continuing to work at making Summit County a desirable place for companies to want to locate and stay. One thing that's for sure about Pry is that he has a heart for community and its children. Something many may not know about Pry is that he was a lawyer for many years before doing what he is now. "I loved being a lawyer and I often joke about the fact that I was not a career 'politician' when I came into being County Executive," he said. If he wasn't County Executive, he says he would go back to practicing law. "I enjoyed it. One of the things I was able to do there was do a lot of things that helped a lot of people. 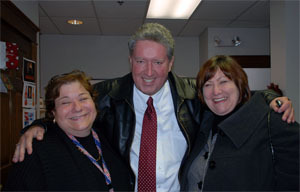 There's value in being able to help people," he shared. "I'm very, very committed to this area," Pry said. If you have any story ideas, questions, or comments you can contact: Katie@akroneur.com.